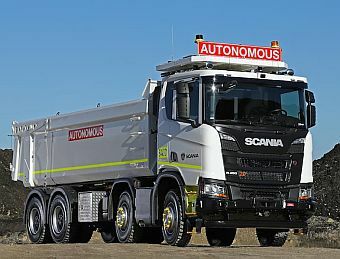 Commercial vehicle manufacturer, Scania, is testing a new generation autonomous transport system at Rio Tinto’s Dampier Salt operations in Western Australia. The first phase of the trial started August 2018, involving a Scania XT 8x4 autonomous tipper working separately from Dampier’s active operations. During this initial stage, a safety driver reportedly rides in the vehicle to observe the truck’s performance and will intervene if required. In subsequent phases, Scania expects additional autonomous trucks will be added to develop vehicle-vehicle awareness and intelligent fleet supervisory controls. “We’re pleased to be trialling this technology in trucks that are smaller than our traditional haul trucks,” said Rio Tinto Head of Productivity & Technical Support, Rob Atkinson. “This has the potential to give us more flexibility in the way we operate in a number of areas across Rio Tinto. We have seen automation create safer and more efficient operations in our business and this is a next step in evaluating options for delivering further improvements through the use of technology,” he said. “Mining sites given their high vehicle utilisation rates are ideal for testing new autonomous technology,” said Head of Scania Mining, Bjorn Winblad. “The industry can reap the safety and productivity benefits of automation, and the experience gained here will be instrumental in developing fully autonomous solutions for other transport applications. It is very encouraging to note that the truck has been performing in a safe manner and in accordance with expectations with regards to the operations,” he said. According to Scania, Rio Tinto has pioneered the use of automation in the mining industry, with the largest fleet of driverless trucks, the world’s first fully-autonomous heavy haul, long distance rail network, and fully autonomous production drills.